Exciting news Update: The mosaic "Petal Power" was awarded "Highly Commended" by the judges in the MAANZ Seductive Smalti 2012 Melbourne Exhibition at Bundoora Homestead. Run your mouse over the image for close-up views! Spring is just around the Corner! 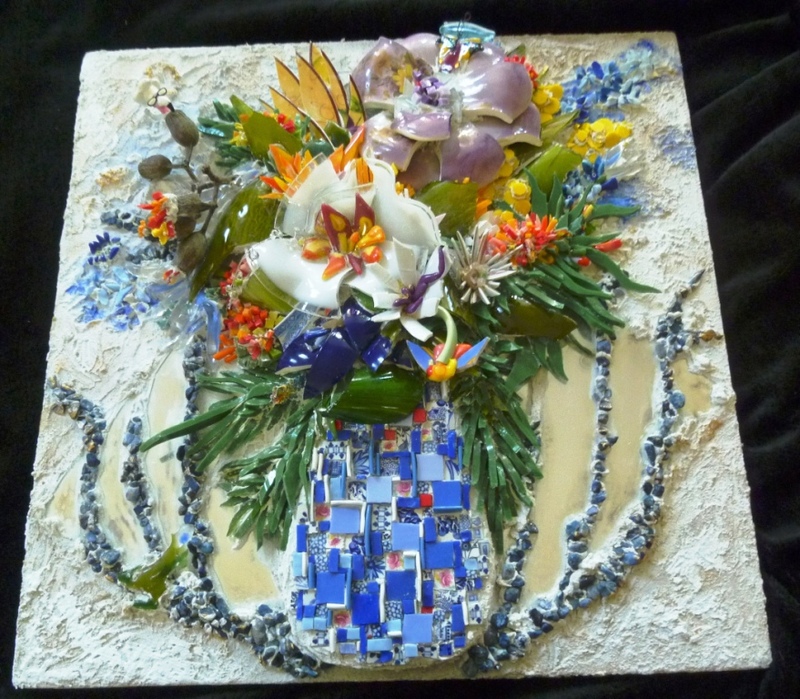 On a sunny winter's day in Brisbane I decided to make a vase of mosaic flowers for my entry for the MAANZ Exhibition, Seductive Smalti, 2012 - Victoria. I had a base board of Marmox Light weight board that Dave had installed the hanging hardware for me quite a while ago. I had prepared the substrate with white Laticrete thinset (cement based adhesive) and had added mirror sections some blue rivers of rocks and mirror background. A lightweight vase had also been glued down and originally I had planned on making a blue and white vase of flowers. However, some time had passed and I wandered around the studio trying to decide on something stimulating to mosaic when I remembered this work in progress. As the sun was shining for the first time in a while, my creative juices were about to flow! I always feel excited when I can "see the final result" of the mosaic before I start. As the brief for the exhibition called for 24% smalti I thought this was a great way to showcase the Dyansty Smalti in a "different mosaic light". Having on hand the most delicious smalti colours in the traditional brick shape, the fabulous blocks and also the most precious smalti slab tiles...I couldn't wait to get stARTed. I was also inspired by the beautiful cards and flowers my mosaicking mother had received during her recent bout of illness. The cards and flowers really cheered her up and the thought of Spring always cheers me up! I set about gathering blue and white china and touches of pink china florals for the "vase" tesserae. It took a while to work out the opus and andamento of the vase, I fiddled for quite a while but all of a sudden it all fell into place and I really enjoyed cutting the smalti, china and putting some of the plate rim on edge; all pushed into the wonderful Laticrete products. Check out our webshop for more info on the products used. My fingers flew cutting glass light shades, nipping smalti into green fern fronds, wattle and banksias and fantasy flowers. The gumnuts feature a flamingo head that was given to me by Flamingo Fanny many years ago. It's so cute! The push-in method of mosaics is very artistic and allows the thinset to really shine as more than an adhesive. My students who complete the OzMosaics Workshop B, really enjoy this adhesive and know how much can be achieved artisically using thinset as backgrounds and plunging tesserae for special effects! I am very happy with this mosaic and look forward to hanging it in our home. I plan to make several more as I get time. We are busy packing materials and supplies for the upcoming mosaic project at Christmas Island in October a huge mosaic seat and wall - we will be working with the Christmas Island Arts and Culture group on the most amazing mosaic murals. Keep warm, happy and healthy! Hope to see you at OzMosaics studio soon or join up as a friend on Facebook. Look for Sandy Robertson Brisbane and don't forget to Like our Facebook Page OzMosaics Studio. It's so good to connect with other mosaic enthusiasts and artists around the world!